Light up dresses are not new - Katy Perry wore one to last year's Met Costume Institute Gala that changed color! The designers of her dress, Cute Circuit, do a lot of great technology meets fashion pieces, I think I should do a write-up on them next! 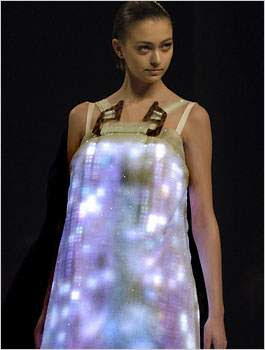 And in 2007, Hussein Chalayan showed a well-regarded LED dress at Paris Fashion Week. It seems light-up dresses have been "the future of fashion" for quite awhile now! But it wasn't until last night that I saw a truly wearable light-up dress. During the Billboard Music Awards, Fergie wore a dress designed by Philips Lighting and stylist B. Akerlund, using light-infused fabric to light up with the beat of the music. Unlike previous incarnations this dress felt surprisingly subtle, less "Look at me, I'm BLINKING!!!!!" and more "Here's a fun enhancement to the little black dress!" Chief Design Officer for Philips said: “As a brand, we seek out to work with artists from a range of different industries to evolve and revolutionise the way we use light. When Fergie challenged us to create something new for her, we wanted to design something that could bring an additional dimension to their audience and help showcase how light can further enhance experiences. What is remarkable with this dress is the way the lighting is integrated with the fabric and works in tandem with the beat of the music." I'd love to learn more about this technology, which doesn't appear to be LED lights, though may possibly be OLED (organic light emitting diode) technology, which can be flat and flexible. You'd think there would be more info on the tech - some people care, dammit! I think OLEDs are the secret to developing wearable lights - you stop looking like a tacky Christmas tree and start looking TRON! What do you think, would you wear light-up clothing or do you think it should stay confined to stage performances?